Councillor Larry Thompson and I have expressed our opposition to plans to introduce on-street Pay and Display parking charges in Holywood after a recently published 2012 Roads Service Holywood Parking Report "recommends" a Pay and Display scheme be "considered in the main commercial streets in the town centre". With Holywood Town Centre enjoying a relatively low vacancy rate and new businesses popping up in recent weeks, the last thing businesses and shoppers need is new charges to replace the 1 hour on street parking limit. 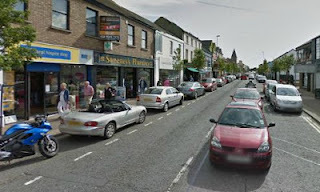 Free parking for up to one hour on Holywood's High Street and surrounding areas is extremely popular with shoppers who are aghast at these plans. Also commenting on the issue, Councillor Larry Thompson said: "Holywood is succeeding due to the range of transport solutions already in place, including opportunity to travel by train, bus, and park off street in a car park or on Holywood's High Street. "Charging people to park in the short stay spaces risks plunging the Town Centre into recession and must be stopped. A longer term approach must be taken, realising that money raised from the fees collected will be strongly overshadowed by a much larger loss of trade and ultimately jobs. I urge Roads Service to abandon this recommendation. Traders need to be helped not hindered via punitive parking charges."